The Dainese Storm rain jacket and pants is something unique. The material is a two ply arrangement. The inside is a white slippery nylon material and the outside surface feels like rubber. Yes, rubber, but its a satin finish rubber that has a soft touch. All the seams are heat sealed so it looks like it would be VERY waterproof. The material is heavier so it doesn’t pack down as small as the Dainese Rain jacket and pants which are a single layer of thin nylon, but no means are they bulky. The Storm rain jacket and pants comes with their own pouches so you can store them away and keep them clean. Dainese says: The perfect match for our Storm Jacket, with the same super-comfortable knitted fabric and reflective inserts. 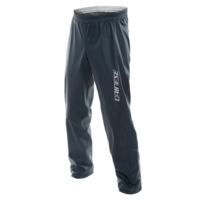 Available in men’s and women’s versions featuring an elasticated waist and adjustable leg bottoms, these packable pants offer a far superior fit and feel to traditional waterproofs.